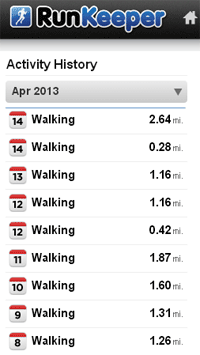 So far I’ve squeezed in a lunchtime walk every day (early days…). Together with a wander around my hometown with Hertford Museum’s Hidden Hertford Walk on Sunday, I have tracked 11.4 miles for the first week in RunKeeper, and spent 1207 calories. To make things more interesting I am also logging all food and drink in MyFitnessPal and tallying my exercise across as the two apps don’t yet talk to each other.